I've always loved the 4th of July. When I was a kid it meant heading up to the family cottage situated on the banks of southern Lake Huron to be with family (loads of family!) and friends (tons of friends). It meant spending the afternoon at the beach and the evening surrounding a bonfire. It meant eating Italian orzo soup and bbq'd chicken with amogio sauce, or, depending on how hot the weather happened to be, plain old hotdogs & hamburgers. It meant a trip into small-town Lexington (Michigan) to visit the General Store and maybe have a Wimpy Burger (at Wimpy's) or maybe even an A&W. Sometimes we'd watch the hometown parade, with the fire engine, clowns, kids on decorated bikes, cheerleaders from the local high school, military veterans, various types of floats pulled by pickup trucks, and even Santa Claus (! ), all march down main street. It also meant, of course, fireworks - more fireworks than one can imagine, though I'm sure all of us here in the States can make that statement. These are real memories, folks, though it sounds like it's the made-up fantasy of Americana from a children's book. But in all honesty, the 4th of July was the best weekend of the summer, and it was really just as I described it here! Even though I was not a living historian back then (we're talking quite a long time ago), I was still a major enthusiast of history, especially American history, and knew we were celebrating our country's birth. But, in all honesty, we really didn't pay quite as much attention to that part. Well, except maybe back in the summer of 1976 when everything was about the bicentennial celebration. Otherwise it was about family fun in the summer sun. 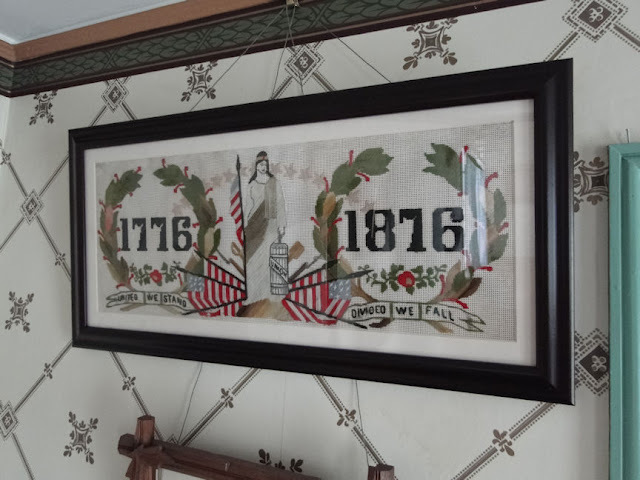 I also loved the way small-town USA would decorate their homes, many of which were from the 19th century, with flags and buntings and other patriotic favors. For this week's post I have taken a few pictures of some of the houses that have that festive look, which can be difficult because many times the owners are right there, and they don't take too kindly to strangers taking pictures of their homes, so I don't have as many as I would like. But I thought I'd post the few of the more patriotic themed shots I do have. 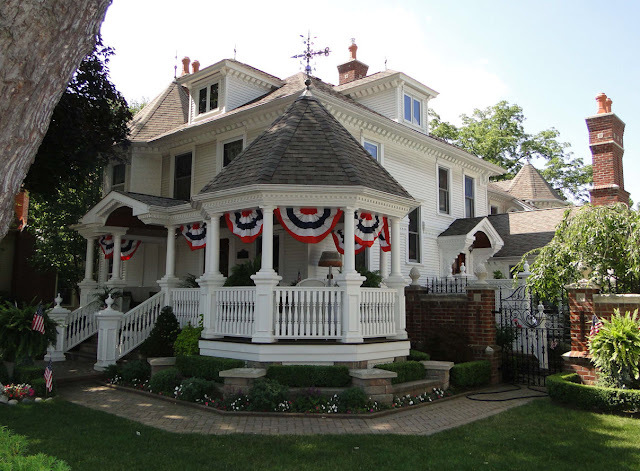 And, yes, I have included a selection of Greenfield Village's patriotic historic homes as well. Let's begin in the Village of Romeo, Michigan, where beautifully restored historic 19th and early 20th century houses abound. 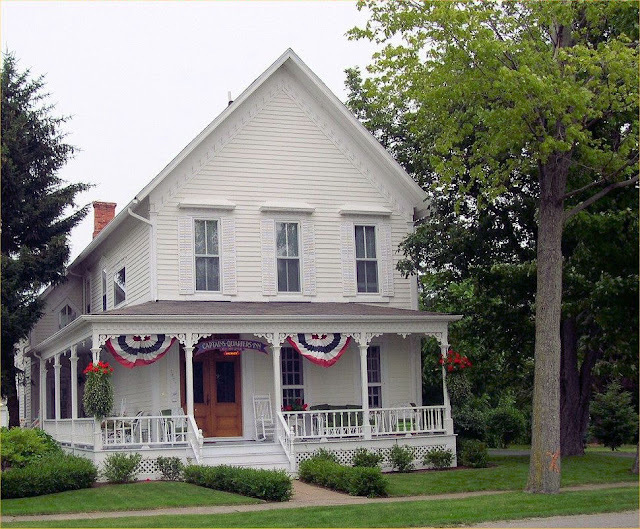 So many, in fact, that the entire village is considered historic and has a marker that will let all visitors know that "the many examples of nineteenth century architecture that remain in the village led Michigan and the federal government to list Romeo as a historic district in 1970." Not over-the-hill in-your-face red, white, and blue, but, well, it is tastefully patriotic. 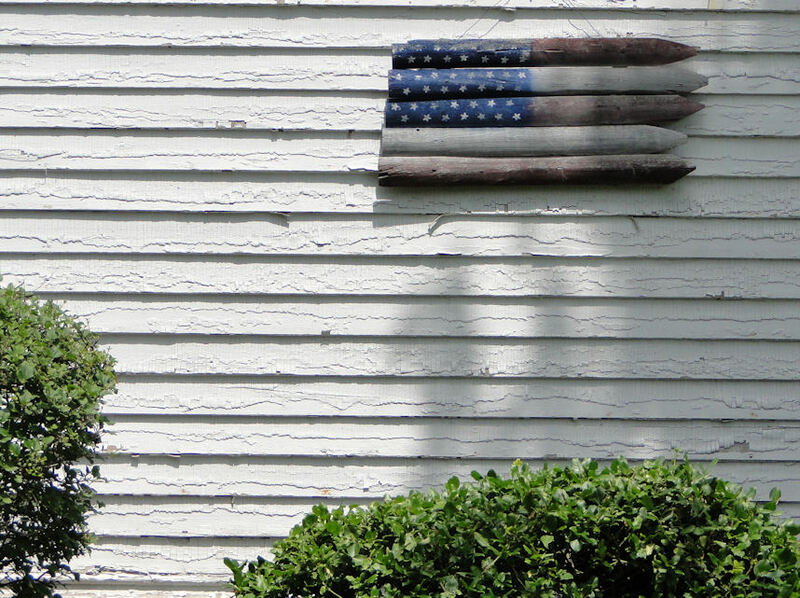 We saw this old wooden picket fence post reconfigured into an American flag and attached to the side of a house. 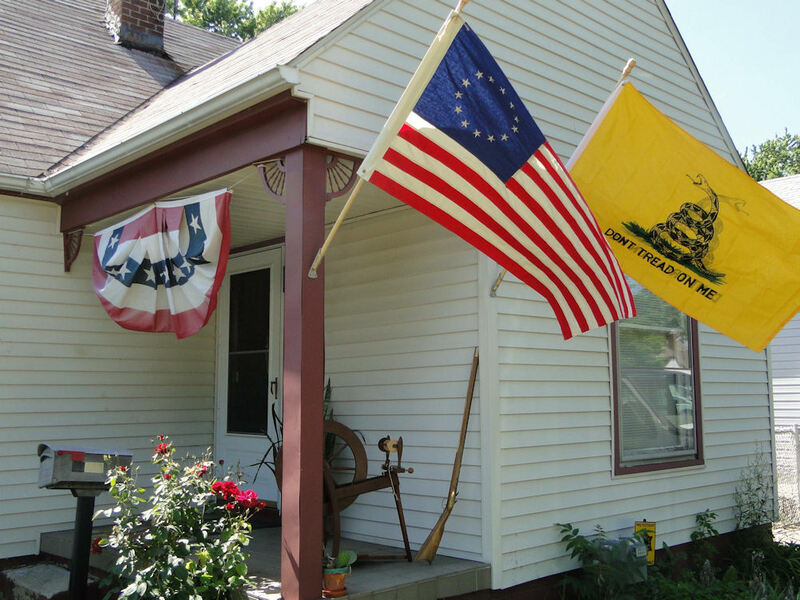 A little creepy, but the flags really stand out in this house. This house sits in the Village of Lexington, Michigan. It's now a bed -n- breakfast. Holly, Michigan: This was an "on-the-run" picture, meaning I stopped in the middle of traffic, snapped the picture in a hurry, then took off, hoping I didn't anger the cars behind me. 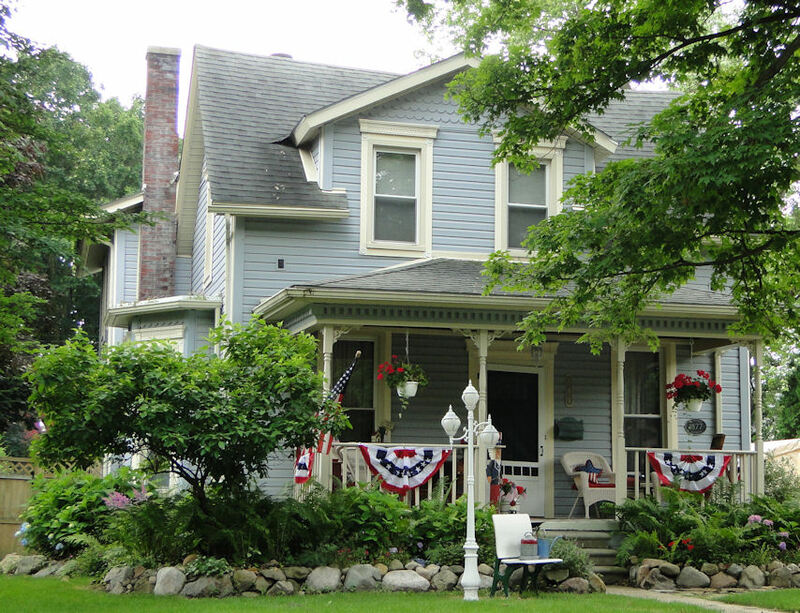 Over in Plymouth, Michigan I found this nicely decorated home. I would love to have a porch like this. Yeah, I know there aren't many outrageously decorated homes here, but it was all I could find. However, most houses had at least one American flag hanging off the porch. That's better than nothing at all, but I just didn't want to take pictures of one-flag houses since they were so plentiful. 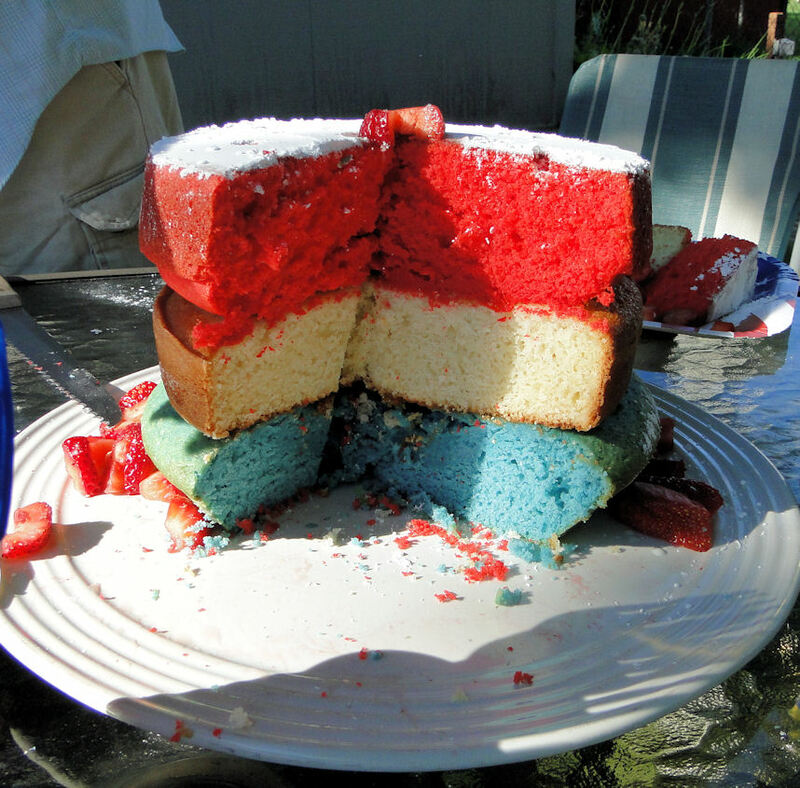 My wife made a "National Cake" - taken from a 19th century recipe. Many thanks to my historical presenter friends for providing it to her. It turned out great! 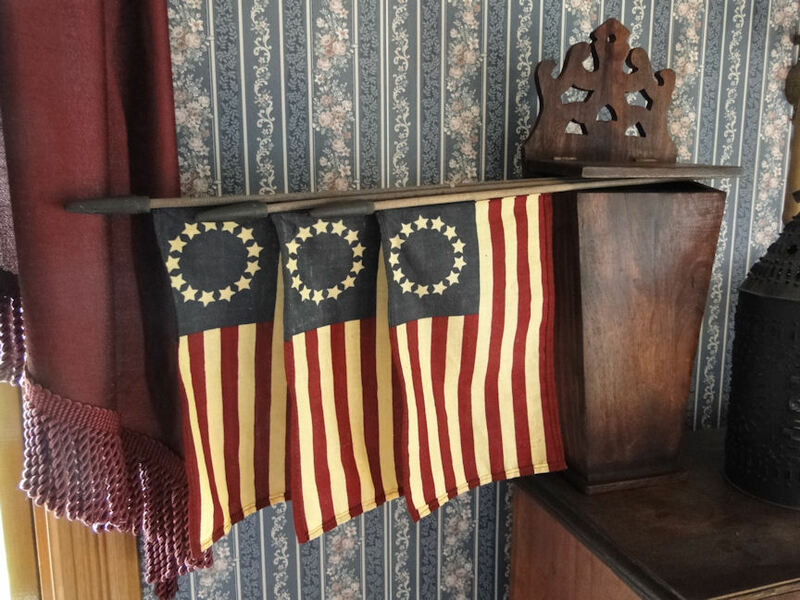 I've never seen miniature Betsy Ross flags around here, so when I saw them at the gift shop at historic Waterloo Farm, I had to buy them. Aren't they cool? "You know, it's the 4th of July - - it's time to make our house look festive to celebrate our Nation's birth!" Firestone Farm presenters always do a fine job showing their patriotism, don't you think? Yep---the farm family at Firestone are all ready to begin their holiday festivities! I like the fact that it's the presenters who work at Firestone that decorate the home and not someone from the corporate office. It gives it that more family feel. Soon this front porch will be busy with activity. "...it was farmers who took all that country and made it America. Don't you ever forget that." "BOOM! The cannons leaped backward, the air was full of flying grass and weeds. Everybody was exclaiming about what a loud noise they had made. "That's the noise that made the Redcoats run!" Mr. Paddock said to Father. "Maybe," Father said, tugging his beard. "But it was muskets that won the Revolution. And don't forget it was axes and plows that made this country." "That's so, come to think of it," Mr. Paddock said. That night when they were going to the house with milk, Almanzo asked Father: "Father, how was it axes and plows that made this country? Didn't we fight England for it?" "We fought for Independence, son," Father said. "It was farmers that took that country and made it America." "Spaniards were soldiers that only wanted gold. The French were fur traders, wanting to make quick money. And England was busy fighting wars. But we were farmers, son; we wanted the land. It was farmers that went over the mountains, and cleared the land, and settled it, and farmed it, and hung on to their farms. It's the biggest country in the world, and it was farmers who took all that country and made it America. Don't you ever forget that." The ladies of the house do a fine job preparing the 4th of July meal, just as in days of old. ...and hanging them out to dry was the rule of the day. It's great to see clothes drying the natural way. We still hang our clothes out on the line at my own home. See? Yep, this is my backyard. Believe it or not, I've read of people in some areas who have actually succeeded in banning clothes hanging out on the line. 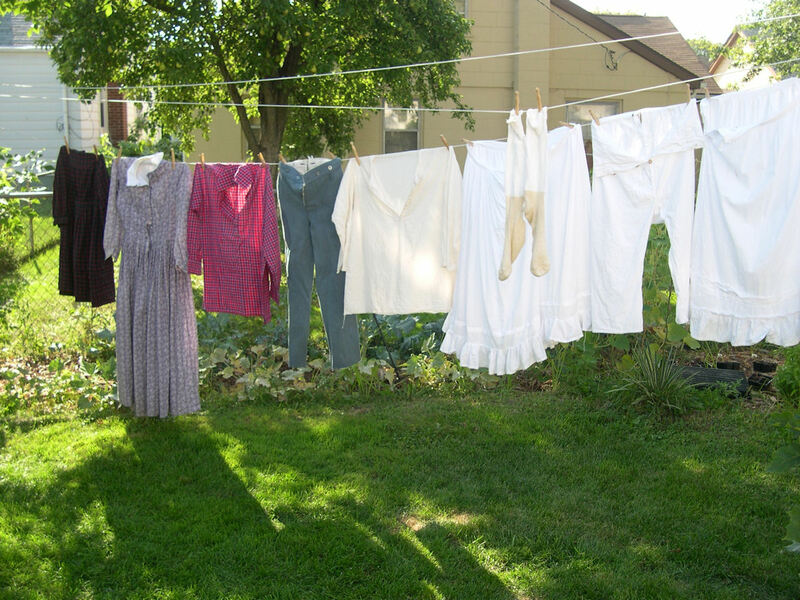 As I found in my google search: "Once upon a time, a clothesline was a standard feature of most back yards. But concern that publicly airing clean laundry attached with clothespins to a rope or wire was unsightly, or obstructed views, or even created a safety risk (strangulation is sometimes cited). States that already have such bans include Arizona, California, Colorado, Florida, Hawaii, Illinois, Indiana, Louisiana, Maine, Maryland, Massachusetts, Nevada, New Mexico, North Carolina, Oregon, Texas, Vermont, Virginia and Wisconsin." From the Seattle Times. Time to relax for the farmers. 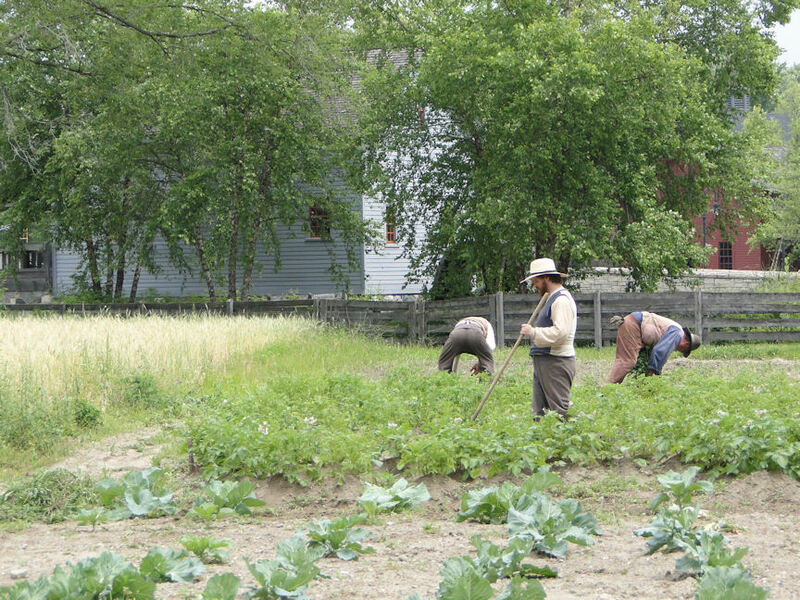 All of the presenters here at Firestone Farm - men and women - work hard throughout the day doing the actual chores of those from the 19th century. A special popular Independence Day activity for farm folk was to make ice cream It was quite a chore but the end result was well worth the work that went into it. Gathering a block of ice from an ice house and hauling it to the porch or cellar was in itself a chore. But then the ice, in a sack, had to be crushed by way of hammer and hatchet. Beaten egg whites, milk, cream, and maple sugar mixed together would then be poured into the tin ice cream maker container fitted inside the wooden bucket, which would then be surrounded by the crushed ice and salt. Now the fun begins: turning the crank to mix and freeze the concoction until it turns into a frozen custard-like cream. And what a treat it was for farm folk of the last half of the 19th century! Amanda must get water for cleaning the dishes. 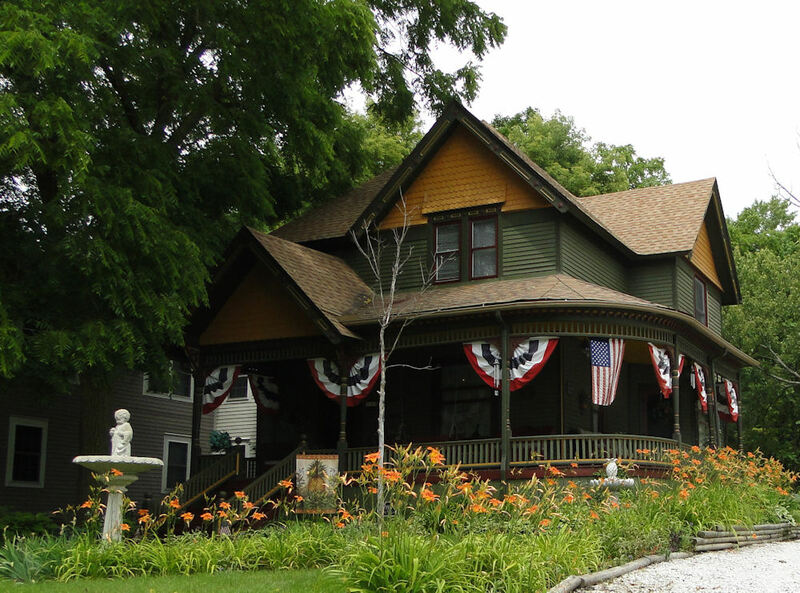 Nope - there is no running water inside this historic home. Doing dishes and laundry builds strong muscles for these ladies! The Firestone presenters enjoy a ride around Greenfield Village: a carriage ride is the perfect way to spend a 4th of July afternoon. Maybe they'll catch a historic baseball game! 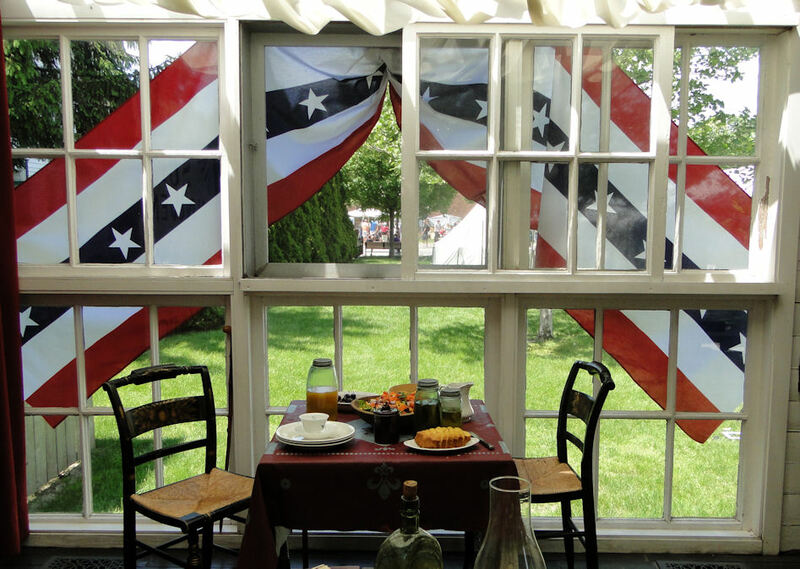 Not sure if the Wright Brothers ever decorated their home for the 4th of July, but if they did, they may have done it up this way. The side of the Wright Bros. porch. 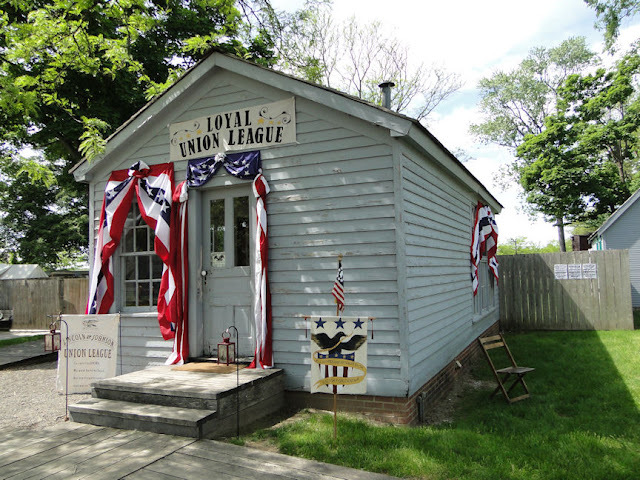 This picture was taken in 2014: I thought the way they decorated the tintype studio as the Loyal Union League looked great; the League did a fine job as well getting President Lincoln re-elected. And a side view of the same building. What a cool replica of a Lincoln lantern! As you can see, ol' Doc Howard has the patriotic spirit! Even something like a simple swag looks good. This is the Scotch Settlement School, where Henry Ford attended in the late 1860s and early 1870s. The cottage home of the grandparents of Thomas Edison is decorated as if it were 1915 and ready for a party. Don't all small towns have a gazebo? A little touch of patriotism at a store window. The front door of the Ford Farm House - the home Henry Ford was born in. Doot doot doo lookin' out Ford's front door! 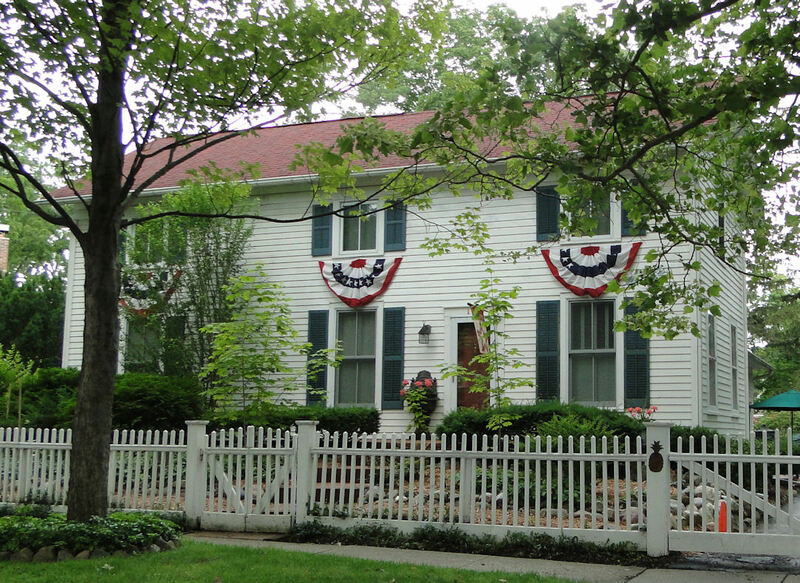 The front of the birthplace of Henry Ford: even the flowers are patriotic! In 1876, the Ford's celebrated the Centennial of the signing of the Declaration of Independence. In 1976 I celebrated the Bicentennial. The Logan County Courthouse: as a circuit-riding lawyer, Abraham Lincoln practiced law here before running for President. 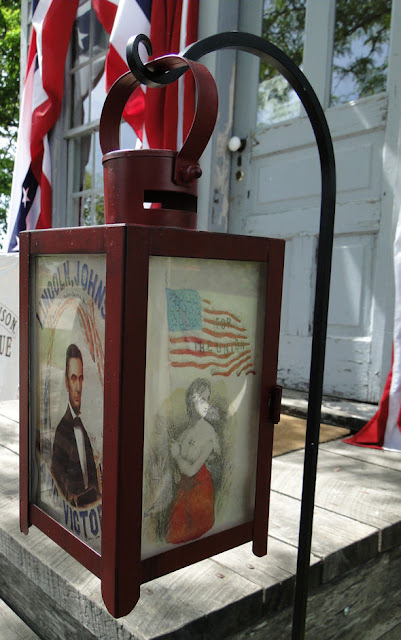 Greenfield Village always decorates the 1831 Eagle Tavern festively. The food here is top-notch, though I wish they had 1800s prices. The Smiths Creek Train Depot: as a young boy, Thomas Edison was thrown off the train here when he accidentally set the baggage car on fire while conducting chemical experiments. Well, there you have it - I think fifty-something pictures is just about enough for now, wouldn't you say? 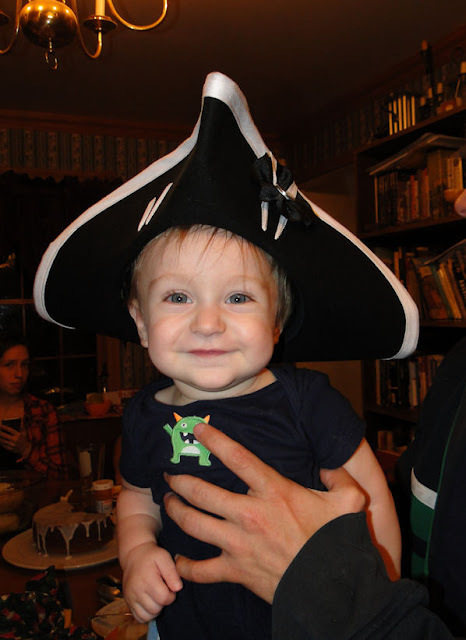 This is my grandson, Benjamin, who got into the patriotic/colonial spirit! With how my son and daughter-in-law are, this young man should grow up with a sense of history, patriotism, and pride. To some who read my blog this may seem like a corny post, and there are many - too many - who feel that showing pride for your country is no longer "cool." There are those who only look at the not-so-good part of our country's history. They tend to overlook the greatness of America, for it's "in" to bash the U.S.A. I feel sad for people like that and have little use for them; I wrote on my Facebook page recently that we should celebrate the good but not forget the bad. And I feel that's what we need to do, for to only look at our problems - past and present - as so many tend to do and not see the positives will remove all sense of pride, which is happening, and that could be disastrous. Wonderful post Ken! Great photos! I especially love the one of your home and of Patti's cake! We were in the parade in 18thc. clothing and Adam shot his brown bess to the delight of all. We then made homemade pizza in the cob clay beehive bake oven we built outdoors in the garden last summer! 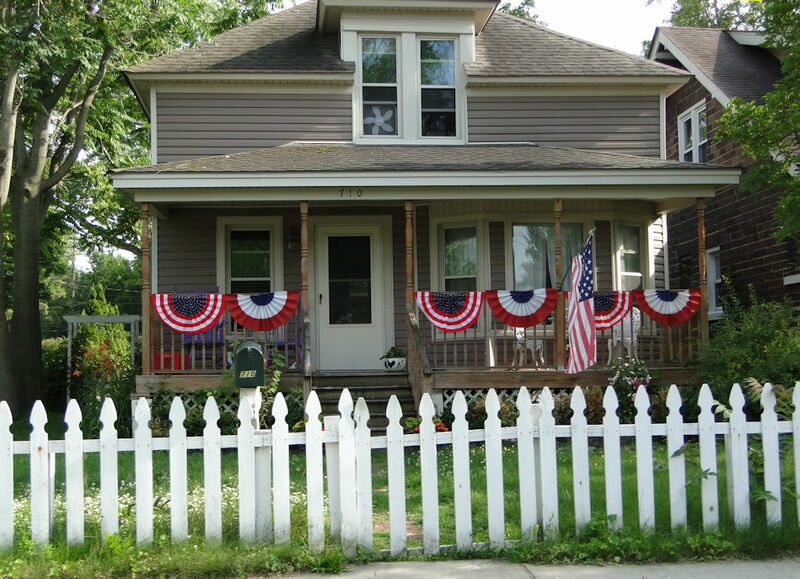 Great post Ken, I really enjoyed seeing all the historic homes decorated with buntings and flags. I really like that front porch on the house in Plymouth too! Thanks for sharing your pride and patriotism for our country with us. Your sweet little grandson is adorable! Thank you for your comments! And I loved your pictures! Awww! You're always so kind! Thank you! In all honesty, this post in a way reminded me of your posts!